The body adapts to stressful, or threatening, situations through the activation of neural mechanisms, mediated through the mid-brain and ultimately culminating in the release of ‘stress hormones’, primarily cortisol and epinephrine. Epinephrine triggers sympathetic nervous system activity, which stimulates our ability to avoid harm from the threat. Cortisol is secreted on the heels of epinephrine in order to limit the cell mediator response to the threat/stressor. Assuming that the threat is resolved, the activation that was led by cortisol lasts for minutes to several hours and then abates. Superimposed on this dynamically responsive system is a circadian rhythm of cortisol secretion. Driven by the pineal gland and so-called clock genes, cortisol production is at its peak in the early hours of the morning and then gradually declines over the course of the day. As we sleep, over the course of the night, cortisol production climbs again to its early morning diurnal zenith. The circadian rhythmicity of cortisol secretion is important for our health. 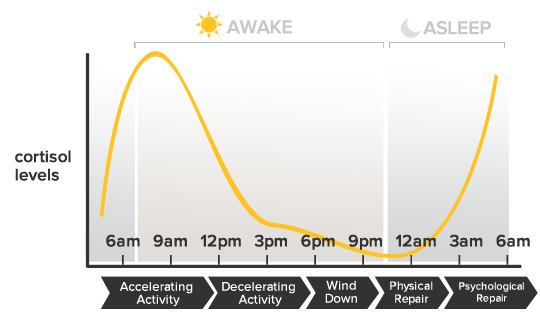 Certain processes are linked to this circadian flow, which is supported by the HPA axis, including processes such as cell repair, immune restoration, and repletion of cellular redox potential are linked to the Circadian rhythm maintained by the HPA axis. Therein lies the rub. People who are confronting real or perceived threats throughout the day create surges of cortisol that can override the circadian pattern. Over time, this has increasing significance and intervention may be needed to support a healthy level of cortisol in order to ensure the hypothalamus and pituitary glands maintain their sensitivity to the negative feedback that cortisol normally creates. Supporting HPA homeostasis can support immune system function, , blood sugar and lipid metabolism, intestinal mucosal integrity, bone metabolism, and influence neurological function to name but a few. There are many integrative strategies to restore HPA axis circadian rhythmicity. These strategies restore normal sensitivity on the part of the hypothalamus and pituitary to the negative feedback of cortisol, exert epigenetic effects that influence clock genes, and alter the activity of the limbic system to reduce threat perception. As these strategies take effect, a healthy pattern of cortisol secretion can be observed (for instance, by saliva test). Cortisol will be at its peak between 6 am and 8 am then decline to its lowest level between 6 pm and 8 pm. Health depends upon circadian synchronicity, making cortisol secretion patterns a unique marker of durable wellness.